February is Black History Month in America. Maybe it is only fitting, then, that the past (few) weeks have focused so much attention on casual white racism. We’re not talking about the open racism of neo-Nazis and or even the kinds of beliefs routinely spouted by bigoted politicians like Iowa Rep. Steve King. No, we’re talking about the racism expressed by supposedly “good” white people, white people Virginia Governor Ralph Northam and Virginia Attorney General Mark Herring, who have otherwise worked to advance progressive causes. White people with black friends and even supporters like Tom Brokaw or Liam Neeson. And just like people who claim they “don’t see color,” this kind of person believes themselves cured of racial bias. Maybe they are uncomfortable reckoning with America’s history, or maybe they just feel confident that that chapter of our nation is closed. But either way, this subtle prejudice helps enable the institutional racism that remains such an insidious part of our culture. This subtle prejudice helps enable the institutional racism that remains such an insidious part of our culture. Both Brokaw and Northam are considered politically progressive white men who have indeed worked to advance civil rights causes. And they have also done and said things that are racist — not racially tinged. No racially insensitive. But racist. Northam’s alleged sin — dressing up in black face — happened decades ago. But as law professor and critical race theorist Khaled Beydoun reminds us, “[It is a] myth that racism declines with time. [In] reality, racism fluidly adapts to prevailing social norms and political interests.” Racism need not be a white supremacist wearing a hood. As times change, racism manifests in new ways — and the myth of color blindness is one of those ways. Myth: Racism declines as time passes. Reality: Racism fluidly adapts to prevailing social norms and political interests. Color blindness — whether talking about the kind right-wing firebrand Tomi Lahren embraces, or the kind Liam Neeson implies when he says he isn’t racist for wanting to kill a random black man — has become a common cover for racism. Unspoken or openly articulated, color blindness does not actually exist in the real world. People of color know this, of course. In reality, some people wear their racism on their sleeve, and others actively work to combat their prejudice. But many (if not most) people have lulled themselves into a false sense of security as far as their own racial biases are concerned. Whether the topic is American slavery or the warrantless spying on American Muslims, we will never be able to dismantle the systems of racial oppression if we cannot reckon with the way our past informs out future. Yes, this is an uncomfortable conversation, but it is one we must have with courage and confidence to confront. To see the ways the past is made present we don’t have to look very hard. Black Americans comprise around 13 percent of America’s population yet make up around 40 percent of the prison population. Black and white Americans use marijuana at the same rates, but black Americans are charged and arrested at much higher rates than white Americans. It isn’t hyperbole to say 21st-century America has once again monetized black slave labor. The massively and disproportionately black and Latino prison labor force is paid pennies on the dollar for dangerous jobs like fire fighting — work they may be denied once released from incarceration. Clearly, the criminal justice system sees color. Baldwin spoke truth. Black Americans with similar educational degrees and qualifications generally earn $20,000 to $50,000 less than white Americans — a wage gap that has grown to a size not seen since the 1950s. The CDC reports that black mothers suffer a 325 percent greater maternal fatality rate than white mothers. The federal government enacted policies to deliberately create black ghettos, and to this day major banks continue to discriminate against black and Latino Americans. Clearly, those with economic power see color. Am I calling all white people racist? No. But I am pointing out that the current power structures still facilitate and perpetuate racially biased norms. There are plenty of kind, well-meaning, intelligent white people in power, and yet the aforementioned economic and practical injustices continue to exist. Northam may now believe he did something wrong, but he doesn’t necessarily view his actions as racist or part of a much bigger pattern. What does this tell us? It tells us that people of color deserve better from our leaders, of course. But it’s also a reminder that complacency is the best way to ensure the cancer of racism continues to thrive in America. It should be unacceptable to anyone committed to national unity and racial understanding. CORRECTION (Feb. 11, 2019, 6 p.m. ET): A previous version of this article misidentified the governor of Virginia. His name is Ralph Northam, not Roger Northam. 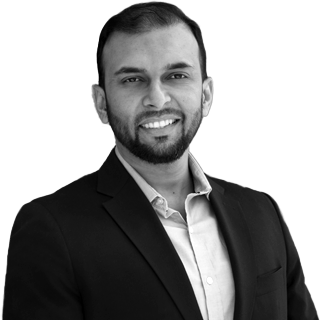 Qasim Rashid is an attorney, author, and a Truman National Security Fellow. Follow him on Twitter @MuslimIQ.